It was rare to have an opportunity to conduct an opinion survey of brokers or related property professionals at the same time and with an ample number for a reliable analysis, the 2017 ARENA in Kuala Lumpur gave Dr.Pornchokchai this opportunity. Let's see the interesting results. 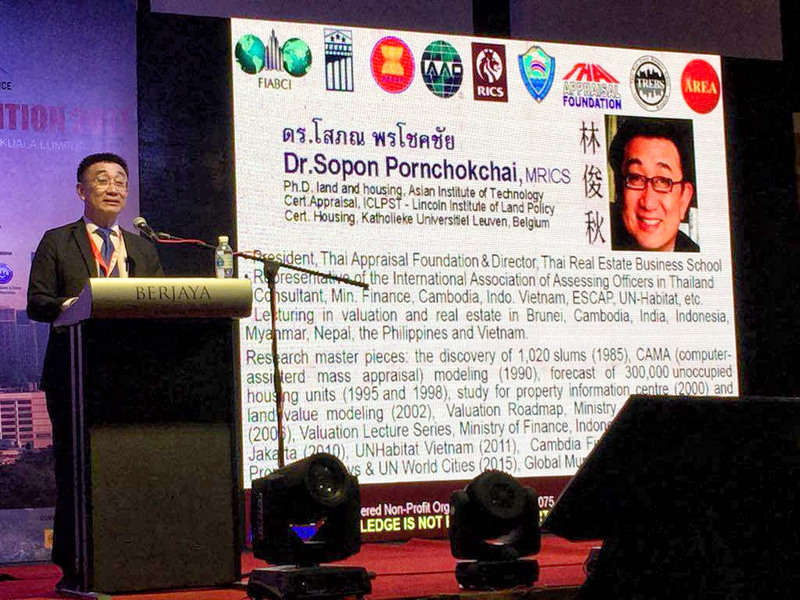 Dr.Sopon Pornchokchai, President, Thai Appraisal Foundation and FIABCI Thailand was in Kuala Lumpur, Malaysia to present his keynote speech on "the ASEAN Property Markets, Performance And Direction" at the ARENA (Asean Real Estate Network Alliance). This 2017 ARENA is held during August 25 to 27, 2017. During his speech, he conducted a questionnaire survey to the participants at the convention. There were almost 600 of them, around half (293) generously answered the questions. The results were very interesting for real estate professionals who are involved in investment in the ASEAN Region. Of the total 293 people who answered the questions, 41% were those from the Philippines, 32% were Malaysians who were the hosts. Myanmar people were the third largest group of 13% Statistically, comments from these three countries were more reliable because of the ample number of respondents. The rest might not be certain because of the smaller number of respondents. However, it might show something interesting as well. These respondents were mostly brokers or property agents or those who help sell properties. There might be some small proportion of other related property professionals. However, we assumed that they were all brokers. Considering the economy, People from Cambodians, Myanmar and the Philippines had very high hope and high growth for their economies. Similarly, in the case of real estate markets, their view during 2017 to 2019 was very promising as well for Cambodian, Myanmar and the Philippines again. However, in the case of Malaysia and Thailand, the prospects were not so good. Perhaps, their markets were a bit saturated. The sales were not as speedy as expected. There was an exception in the case of Singapore where it seemed quite bright. However, due to the small sample size, this result might not be considered. The most active property sectors in each country should also be examined. In the case of Malaysia, there was a diversity. However, the largest proportion was housing a whole (32%). This might be landed properties expanded along toll roads around Kuala Lumpur. Then all forms of commercial properties such as shopping centres and supermarkets (24%). Industrial properties were the third in the priority (19%). Amazingly, the most mentioned category of booming sector in Myanmar was the group of industrial properties (26%). Perhaps, there have been a lot of manufacturing developments in Myanmar because of cheap labor. Condominiums were the second in the priority (18%) followed by housing (12%). In the case of the Philippines, housing was mentioned for around 28% This implies that the booming today is related to the residential sectors. Then, it would be commercial developments such as shopping centres (20%). The third were those condominiums (14%) followed by industrial properties (10%). For other countries, it was intended to show the results without any concrete conclusion because of the smaller number of respondents. It would be very interesting to learn where people from the ASEAN Region to buy properties abroad either within this Region or outside the Region. These respondents who were mostly brokers should be able to represent the people in their countries. In the case of Malaysia, some one-fifth (22%) of them would like to buy in Australia which might be the most popular destination for them. Thailand was the second in the priority (17%) followed by Singapore (15%) and United Kingdom (12%). Malaysia was a Commonwealth country; therefore, there might be some tight together. Malaysian were also interested in other ASEAN countries such as Vietnam (7%), Indonesia (4%) and the like. In the case of Myanmar, it found that around 35% would like to buy in Thailand followed by Singapore (29%). In our previous survey, we found that Singapore was the first priority for people from Myanmar (March 27, 2017: http://bit.ly/2p1l5Mg and October 22, 2015: http://bit.ly/1RW39tL). However, Singapore had a high tax burden. These latest group of respondents had experience in traveling to both Thailand and Singapore and realized this burden. So they opted Thailand as the first in the priority. In the case of the Philippines, they preferred Singapore as the first in the priority (21%) followed by Malaysia (17%) and USA (14%). Thailand got only 7% Perhaps, people from the Philippines were closed to both Singapore and Malaysia. For the USA where so many people from the Philippines move there, it was still a great destination for them. However, there were still some gap (not dispute) between Thailand and the Philippines. There was a crucial question to these brokers. If a medical doctor gained a professional credibility score at 10 (full score), what should be the score of property related professionals such as brokers, valuers, property manager, bankers and lawyer. 1. Malaysian brokers voted brokers at 6.3 by 10, valuers (6.7), bankers (6.7, lawyers (7.0) and the lowest was property managers (6.1). Many of the broker in Malaysia were both brokers and valuers. 2. Brokers from Myanmar assessed themselves at 5.8 slightly better than valuers (5.6). They perceived bankers and lawyers at significantly higher scores (7.5 and 6.8). 3. For the Philippines, amazingly, brokers got a very high score at 8. The rest got lower score significantly. Perhaps, the respondents were mostly brokers themselves and they were licensed and organized very well. In the case of Thailand in 2005, we found something similar to the Philippines where the respondents (valuers and their clients) voted valuers at 7.9 out of 10 (https://goo.gl/jXu5zY). 1. In the assessment of economy, Cambodians, Myanmar and the Philippines had a very high hope for their economies. 2. Similarly, in the case of real estate markets, their view during 2017 to 2019 was very promising as well for Cambodian, Myanmar and the Philippines as well. However, in the case of Malaysia and Thailand, the prospects were not so good. Perhaps, their markets were a bit saturated. 3. Considering the booming property sectors in the case of Malaysia, it was housing a whole (32%) followed by commercial properties (24%). It was industrial properties (26%) in Myanmar followed by housing (28%). In the case of the Philippines, housing was mentioned for around 28% followed by commercial developments (20%). 4. In the case of buying properties abroad, some one-fifth (22%) of Malaysians would like to buy in Australia which might be the most popular destination for them. Thailand was the second in the priority (17%). For Myanmar, 35% would like to buy in Thailand followed by Singapore (29%). In the case of the Philippines, they preferred Singapore as the first in the priority (21%) followed by Malaysia (17%) and USA (14%). 5. About the credibility of property professionals assessed by brokers, Malaysian brokers voted brokers at 6.3 by 10, valuers (6.7), bankers (6.7, lawyers (7.0) and the lowest was property managers (6.1). Whereas brokers from Myanmar assessed themselves at 5.8 slightly better than valuers (5.6). For the Philippines, brokers got a very high score at 8. Perhaps, the respondents were mostly brokers themselves and they were licensed and organized very well. Nowadays, a conventional way for a broker to build trust is to tap with large professional organizations from the UK or USA to make himself or herself prominent. However, in most caes, we may have to pay high annual membership fee and to use their accreditation, we have to pay extra fee as well. But it is still not an answer to get more and effective income because we have not yet protect the consumers properly. It is better to spend the money to invest in the trust to the consumers. Therefore, a major recommendation for property professionals such as brokers, valuers and property managers is to have strong indemnity insurance applied for all on their professional practices. On one hand, this might be a burden for them but on the other, as a measure on consumers' protection, it would lift up their professional credibility. In addition, an efficient and effective check and balance or quality control system must be in existence in order to build trust for consumers and to regulate professionals practically.